In G Hall, hot dogs were everywhere Thursday morning. Hanging from the ceiling. Piled in water fountains. Even on bathroom stall handles in the girl’s bathroom. The Class of 2018 came together for another senior class prank, with at least 30 people involved. The prank, which was approved by administration, started with a group of seniors brainstorming ideas in a group chat. One of the seniors sent out an email to the Class of 2018 inviting anyone to join. Last night, approximately 20 seniors went to Reynold’s house to prepare at 9:00 p.m.
“I got 45 minutes of sleep, so we were out until probably 1:30 a.m., stringing hot dogs, putting them in coolers, getting ready, and we got here at 6 a.m.,” Reynolds said. They enjoyed watching people trying to navigate through the hot dogs without getting hit. “I hope they laugh, and I hope they get hit in the face with a weiner,” Liebst said. Freshman Malia Hernandez thought the prank was funny and enjoyed it. Others disliked the prank, particularly because of the raw hot dogs. 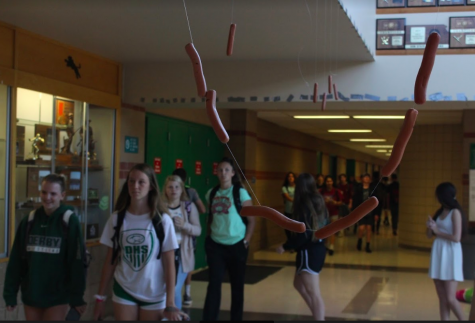 “It’s gross because it’s open hot dogs and it stinks and you can’t even walk down the hallway without wanting to throw up,” freshman Ellie Tanner said. Regardless of what others thought, the seniors involved were proud of their prank. “I’m really happy it happened, and we really pulled it off and came together as a senior class and just had fun with it,” senior Brileigh Meirowsky said.